On 14th June 1925, the first mass was celebrated in the Parish of Borehamwood in a house called The Grange, owned then by Mr RA Caramen, the chapel held 50 people and in 1926 the first catechism classes were held by Fr Sims. By 1927 it was becoming apparent in Westminster that there was now a need for a Catholic church to be built and in 1932, The Catholic Times, reported that a new church of St Teresa had replaced the chapel in Elstree. This was the building that we now use as the Parish Centre, it cost £3000 and Sunday Mass was soon being heard there, along with an early mass at the chapel at the Grange. Fr Baldwin replaced Fr Sims and an active social club was formed with dances in the hall. In 1936, Fr Harrington replaced Fr Baldwin and a piece of land was bought for £600 for a Catholic school to be built. This became St Teresa’s Primary School. Over the next few years the Parish raised funds and continued to thrive. In 1939 a second hall was erected, on the site of the current church. This was used as a social hall for a couple of years before it was taken over by the Ministry of Food during World War Two. 1943 saw Fr Carter become Parish Priest. He died in 1950 and his place was taken by Fr Murray, who oversaw the building of both the current church and St Teresa’s School. A quiet mannered man, he stayed at St Teresa’s for 24 years, riding everywhere on his black bike. He is buried at St Edmund’s College at Ware and a measure of in how high regard he was held was shown by our recent collection. We discovered that he did not have a headstone at St Edmund’s and within a matter of weeks, the Parish had raised the funds required. We hope to have a special trip to St Edmund’s, once the Headstone is erected. In 1955, the Parish was divided into two when SS John Fisher & Thomas More was built and in 1957, St Teresa’s School opened, serving children from both churches. Between 1961 and December 1962, the present church was built. The Architects were the well known FX Velarde Partnership of Liverpool, the Foundation Stone was laid by Cardinal Godfrey and the cost of the church was £50,014.10. Fr Murray moved to Much Hadham and Fr Philip Rogers joined the Parish, bringing with him, his sister Margaret. They worked tirelessly with Fund raising to clear the debts and in 1978, Cardinal Basil Hume consecrated the church. 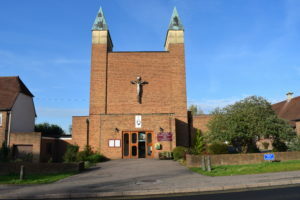 In 1985, Fr Rogers retired but he and Margaret remained in the Parish, in 1992 a Thanksgiving Mass was held at St Teresa’s for the Golden Jubilee of his Ordination in the prescence of the Bishop of Hertsfordshire, James O’Brien. Fr Peter Maher became the Parish Priest and in 1986, Cardinal Basil Hume ordained to the Priesthood, Michael John Mannion, a former Parishioner of St Teresa’s. Fr Maher left in 1993 and Fr John Woods came from St Aidan’s Parish in East Acton. Unfortunately, he soon learnt that the Parish Centre (formerly the original church), had a serious subsidence problem and once again, major building work was required. in 2001, Fr John was replaced by Fr Peter Lyness who remained as Priest at St Teresa’s until 2008, when it was decided to reunite the two parishes forming a joint Parish for Borehamwood’s Catholic Community. In order to do this, Fr Michael Daley was appointed Parish Priest of both St Teresa’s and St John Fisher & Thomas More. To help him with this large congregation, the Diocese had also enlisted two Sisters from the Sisters of Mercy Convent, Sr Margaret Jones & Sr Mary Meaney. Fr Michael was based at St Teresa’s and the Sisters lived at SS John Fisher & Thomas More. They began with combining the catechetical programmes and so moved one, creating one combined parish. In 2010, Fr Dominic McKenna , formerly Parish Priest of Camden Town, replaced Fr Michael. Fr Dominic continued to reinforce links between the two churches and started the Annual Parish Party and Hog Roast which has become one of our main social and fund raising events of the year. He also introduced coach trips and the parishes have enjoyed day trips to Bruges, Southend, Clacton and Chessington World of Adventure. We also of course, had pilgrimages to Hyde Park & to Birmingham during the Papal Visit. Fr Dominic is a great cook and has instituted monthly Parish Sunday Lunches to which all are welcome in exchange for a small donation or help with the washing-up! The annual International Lunches in September/October for the feast day of St Teresa (1st October) celebrate the exciting diversity of our parish. On International Day 2011, we said Goodbye to Sr Margaret & Sr Mary who had to move on and are sadly missed. We then had a year long residency of a group of the Young Christian Workers (YCW)at the Presbytery and they helped to set up our young persons group, Impact, who can be relied to help out on every occasion. Around this time, Colette Joyce became the Pastoral Assistant for both churches, helping to run the main Catechetical Programmes each year. She also facilitates a flourishing children’s liturgy for around 100 children across two Masses each Sunday.